Hello dear Forget The Box readers! The clocks have sped up, we just had our first day of spring and things are looking on the up and up. You can feel it in the air as the sun shone the other day and everyone felt anticipation for the good weather on its way in. It’s a very hopeful time of the year and the artists this week are the first performers to bring in this wonderful season: there’s 16 year old prodigy Billie Eilish, pop music’s savior from the likes of Britney Spears and company, the classic old school metal Iced Earth, and local working class musicians Naghmeh and the Southern Shores all playing in town this week. – Fred di Santo, Artist Relations @ Godin Guitars. Come check out Iranian Canadian front woman Naghmeh Shafiei and her bandmates Don Pinkerton (drums), David Saveliosky (bass) and Seth Duin (lead guitar) for a late brunch performance at L’Escalier. 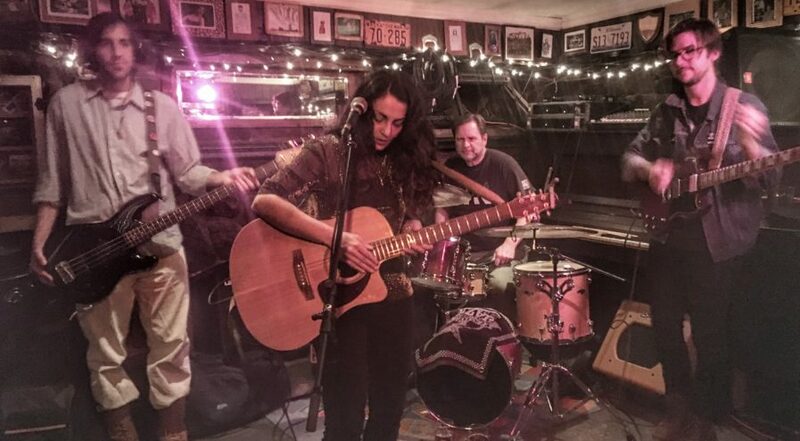 Fusing Persian melodies and rhythms in her vocals with soulful rock and folk influences, Naghmeh draws bits and pieces from the likes of Metallica and The Eagles, and her open minded taste in several genres. If you are a fan of melodramatic/quasi-sarcastic lyrics, you are sure to be entertained. It’s always a score to come see a band of seasoned performers play. This hard working band plays a live gig or two every month, so the four-piece are not new to the scene. They’ve hit up Casa Del Popolo, Grumpys, and Brutopia among other well known bars. Naghmeh had been gracing the stages of open mics in Vancouver, San Francisco, Buenos Aires, Calgary, and Berlin prior to settling down in Montreal. And it shows. The energetic front woman has great stage presence and knows how to work a crowd. Hailing from Tampa Florida, birthplace of Death Metal, Iced Earth brings its 34 year rich history to Montreal. Spearheaded by founding member and main songwriter/guitarist Jon Schaffer, with 11 studio albums thus far, fans of bands like Death and Testament are in for a real treat. .So come join Iced Earth for a night of old school thrash, power metal and that special Florida metal sound that grows alongside the orange tree groves of Sunkist. If you haven’t hear of 16 year old prodigy Billie Eilish, you’ve definitely heard her single Ocean Eyes that went viral and has 35 million streams on Spotify. The young musician is making waves, with Apple naming her their Upnext Artist last October. Born into a family of actors and musicians, Eilish was raised and home schooled in Los Angeles where at age 11 she started writing songs with her brother. Although her songs are pop in nature, she’s got an unusual take on the genre. The pop star also has a unconventional style: baggy pants, track suits, silver hair and likes wearing a Louis Vuitton scarf around her neck in the heat of the summer.